Summary: Tree nuts and peanuts are often sold to consumers in raw form with their skins removed. However, research has shown that some of the most important cancer-fighting nutrients are contained in the skins. These nutrients, called flavanoids, inhibit tumor blood vessel growth (angiogenesis), a key step in cancer development, and may also protect cells from damage by environmental toxins. A recent laboratory study demonstrated that flavanoids are concentrated in the skins of nuts and are made even more potent by roasting them. The roasted skins of peanuts and hazelnuts were particularly high in beneficial flavanoids. 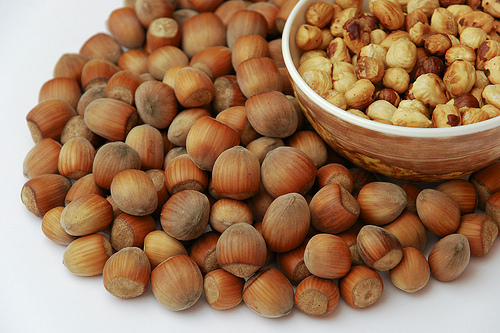 Tree nuts and peanuts have long been known to be rich sources of important nutrients. Peanuts in particular contain a class of natural compounds called flavanoids that have protective effects against cancer, including inhibiting the growth of tumor blood vessels (angiogenesis). The antiangiogenic and anti-tumor effects of flavanoids have been demonstrated in numerous research studies. Flavanoids derived from peanuts directly inhibit the growth of a type of cell that forms new blood vessels, the first step in tumor angiogenesis. Naturally occurring compounds within the flavanoid class, which include promising antiangiogenic agents such as catechin and epigallocatechin, are enriched in peanuts and many other types of fruits and vegetables. Of interest, research has shown that roasting nuts significantly increases their flavanoid content, and that most of these flavanoids are concentrated in the skins of nuts. In one study, European researchers obtained skins from peanuts, hazelnuts, and almonds from a local company, roasted them, and then performed biochemical testing to quantify the amounts of flavanoids. Their experiments confirmed that the nuts’ skins contained significant amounts of various flavanoid subtypes. Peanuts and hazelnuts had similar amounts of total flavanoids, on the order of 75-100 milligrams per gram of skin, but almonds contained only a fifth of that. Furthermore, the scientists isolated catechin and epicatechin within the nuts’ skins; both of these flavanoids have demonstrated potent antiangiogenic effects in laboratory studies. The skins are often removed during processing and used for animal feed or energy production. Consumers therefore often consume nuts without their skins, which may deprive them of an important nutrient source. If possible, nuts should be consumed roasted in their skins in order to obtain the greatest amount of cancer-protective nutrients. 1. Lopes RM, Agostini-Costa TD, Gimenes MA, Silveira D. Chemical Composition and Biological Activities of Arachis Species. J Agric Food Chem. 2011 May 11;59(9):4321-4330. Epub 2011 Apr 14. 2. Monagas M, Garrido I, Lebrón-Aguilar R, Gómez-Cordovés MC, Rybarczyk A, Amarowicz R, Bartolomé B. Comparative flavan-3-ol profile and antioxidant capacity of roasted peanut, hazelnut, and almond skins. J Agric Food Chem. 2009 Nov 25;57(22):10590-9.